Gustav Mahler was one of the last of the grand romantic composers. Explore his difficult life and sublime music in this biography. 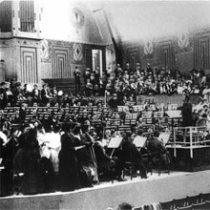 Mahler spent his lifetime as an orchestral conductor. His fame as a composer only became big many years after he died. His major works, symphonies and epic song cycles, are the legacy of a composer who mastered the art of poetic orchestration. Gustav Mahler was born into a Jewish German-speaking family in Bohemia in 1860. From the outset he was an outsider, a feeling which would remain with him his whole life, wherever he went. His father managed an inn, and later opened a brewery. He was prosperous enough to support Gustav's early musical career. His family moved to Jihlava where young Gustav heard the music of streets and the gallant march tunes of the town military band. He started learning piano at the age of 4, and progressed very quickly. At one stage he was young and enough and skilled enough to earn "child prodigy" status. He gave his first public performance at age 10. Mahler likely started conducting whilst studying at the conservatory. He was also in the orchestra, although apparently relegated to the percussion section! He left the conservatory at age 18, and began to study literature and philosophy at Vienna University. Mahler taught piano and composed a bit after that, took his first conducting job aged 20, and conducted his first full opera at 21. He had a string of small conducting jobs after, none of them very pleasant, until he landed a 6 year contract with the prestigious Leipzig Opera, to begin in 1886. One of his first jobs was to conduct Wagner's Ring Cycle, but the orchestra didn't like his dictatorial manner and heavy rehearsal schedules very much. Still, he managed to get them to do what he wanted! 1889 was a tough year for Gustav Mahler. His father died, then a few months later his sister and mother passed away aw well. The year featured the premiere of his first symphony, but it wasn't well-received at all. He resigned from Leipzig after 2 years on the job, and got a post as director of the Royal Hungarian Opera in Budapest. After that he took on posts in Hamburg, Leipzig, Vienna, and visited New York frequently towards the end of his life to conduct. Despite mounting fame and responsibility as a conductor (he was eventually music director with the New York Philharmonic, and considered one of the world's greatest conductors), composing was his calling. He took to composing in a beautiful cottage by a lake in Austria each summer. But the public and critics were confused by his compositions, and generally had negative opinions during Gustav Mahler's lifetime. He was also subjected to anti-Semitism on occasion. In 1909 he lost his 4 year old daughter to scarlet fever. It was made more poignant by that fact that he had written Kindertotenlieder (Songs on the Death of Children) just a few years earlier. 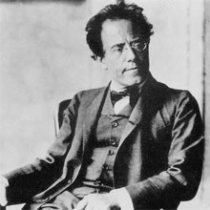 Mahler died in May 1911 from a heart condition. He was 50 years old. Gustav Mahler's music is rich, languid, with deep rivers of nostalgia and anguish - typically "late Romantic", free-flowing and epic in scale. The majority of his music is for orchestra. I think the fact that he spent most of his life on the conductor's podium made him an unmatched expert on how an orchestra breathes and functions. He has an absolute mastery of color and tone, and treats the orchestra like a collection of soloists. It's often said that his music is about "life". He injects every possible kind of emotion into his music, contrasting moods sublimely. Melancholy, comedy, love, despair, laughter, wistful happiness, rage all feature, sometimes intertwined in the same moment (just like in life?). So many tragic events in Mahler's life certainly inspired his art - some of his music can be interpreted as autobiographical. Gustav edited his own pieces frequently, adding new parts and removing bits he didn't like anymore. For Mahler enthusiasts there are multiple versions of some of his pieces. Mahler's later music features the influence of his peaceful summer cottage on the lake in Austria. He uses the orchestra to imitate sounds from nature. The core of Mahler's output are his symphonies and song cycles (in fact there are pretty much the only genres he wrote in). He seems to have a special fondness for singers, since he also included them in a few of his symphonic works. Das Lied von der Erde is even a cross between symphony and orchestral song, not recognizably either. Public reception of Mahler's music was confused and sometimes hostile. He had many more failed premieres than successful ones, and his music never really took hold in European hearts until after 1945. After that, however, he skyrocketed into one of the most popular composers out there, despite his relatively small output. Gustav Mahler's most important pieces are definitely the symphonies and song-cycles. A few of the symphonies even feature voices prominently - they're sort of mixes of songs and symphonies. 10 symphonies (1 unfinished), including no. 8 "The Symphony of a Thousand"
You might also like the music of Richard Wagner, which is equally heavy and lavish.